Planning to visit Canada for a short period? You can do so only if you have a temporary resident visa. Whether you are tourist or temporary workers who are coming on work permit or need to visit Canada for business you will have to apply for a visa. However there are some countries that are exempt from the visa. The residents of these visa exempt countries need to apply for Electronic Travel Authorization(ETA) . It must be noted that the residents of the USA do not require an ETA. If you have plans to visit Canada then you will have to apply for the Canada temporary resident Visa. You will need to fulfil some basic formalities. The applicant needs to have a valid passport. He needs to submit the copies of the passport along with the photographs. The applicant needs to give proof of funds. This is to show that the applicant has enough funds to support himself and any dependants that are travelling with him during his stay in Canada. He needs to convince the authorities that he has enough reasons to come back to his country. He needs to convince the authorities that he will leave Canada before the visa expires. The candidate may also have to give a moral certificate and health certificate. The applicant can apply for the visa online. He needs to create the electronic copies of the documents and upload the same. He also needs to have a valid credit card to make online payments of the visa fees. The applicant can also apply for the visa on paper. He needs to submit the completed application at the local visa office. It must be noted that if you have plans to Migrate to Canada then a temporary visa will not help. With this visa you can stay in Canada only for a short period. For residing in Canada you need to apply for a permanent resident visa. Visa and immigration formalities can be very confusing for the layman. It is always better to take the advice of a good visa and immigration consultant. A good expert will be able to guide you in the best possible way. One of the most reputed Canada Immigration Consultants is undoubtedly Kansas Overseas Careers. 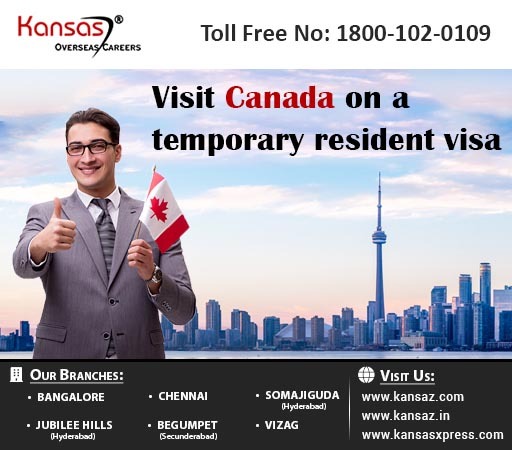 We at Kansas Overseas Careers have successfully helped candidates apply for different types of visas for Canada. Our experts are well versed with all the details about visa and immigration to Canada. We provide the best support in all aspects of visa and immigration consultancy. A temporary resident visa will help you explore the maple leaf country. If you have plans to visit Canada for any reason then you will need appropriate visa. To know more about the visa formalities you can contact our immigration experts who have years of experience in visa consultancy.